Anti-racism campaigners have called YouTube star Logan Paul "irresponsible and unwise" for interviewing conspiracy theorist Alex Jones on his channel. Mr Jones is currently banned from YouTube for violating the site's policy on abusive behaviour. The Hope Not Hate campaign said it was a mistake for Mr Paul to "give a platform to an extremist". During the wide-ranging interview Mr Paul laughs and jokes with Mr Jones about his widely contested beliefs, at one point going along with Mr Jones's claim that former US presidential candidate Hillary Clinton is "crazy". However, Mr Paul does challenge Mr Jones, who is being sued for defamation by parents of children killed during the 2012 Sandy Hook school shooting, on his views on the massacre, saying his view of it as a hoax could "become something dangerous". "Paul seems to have given a platform to an extremist simply to generate more views and appears to have portrayed his guest as an amusement," he said. 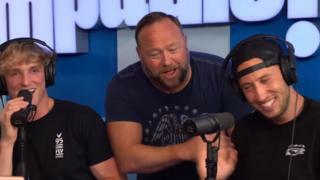 He added: "Paul described Jones as "a far-right conspiracy theorist" and yet still decided to have him on his show, meaning he knew what he was doing and seemingly didn't seem to care." Mr Mulhall said the show could mean Mr Jones is exposed to a "new and younger audience". And almost 19 million people subscribe to Mr Paul's main YouTube channel.